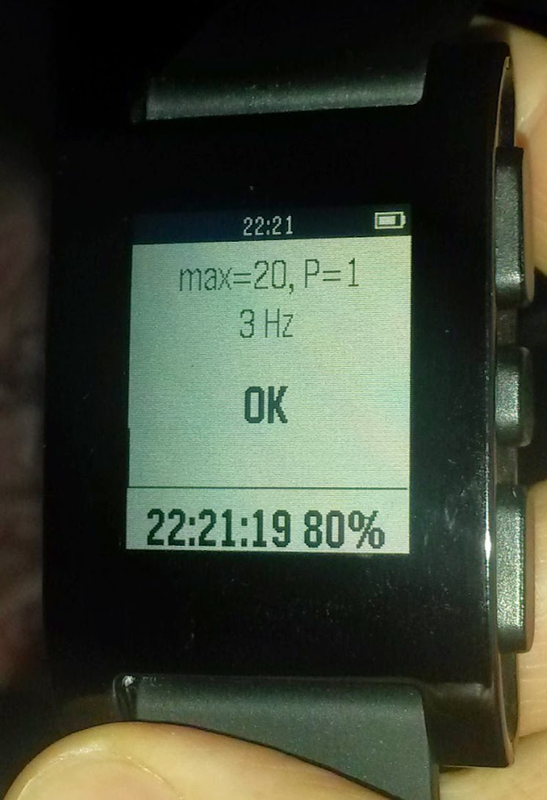 Open Seizure Detector is an experimental epileptic (tonic-clonic)seizure detector / alert system that utilises a smart-watch todetect shaking, and raises an alarm for a carer. If the wearer ofthe watch shakes for 15-20 seconds, the device will produce awarning. If the shaking continues for another 10 seconds it raisesan alarm. The phone app communicates with the smart-watch and canraise alarms in one of two ways: - If it is being used in the home,other devices can connect to it via WiFi to receive alarmnotifications. - If it is being used outside it can be configuredto send SMS text message notifications that include the location ofthe user, as wifi notifications are not possible away from home Thesystem includes self-checking to make sure it is functioningcorrectly, and will beep to warn the user of faults to help providereassurance that it is working. You need a Pebble Smart Watch or aPebble Time Smart Watch that is connected to your Android devicefor OpenSeizureDetector to work.. Note that manufacture of Pebblewatches has been discontinued, but this app will continue to workdespite this (and pebble watches are still available at themoment). Note that there is a version currently being tested thatprovides support for a high-end Garmin watch as an alternative -this will be released in a few weeks. It does not use any externalweb services to detect seizures or raise alarms, so is notdependent on an internet connection to work, and no subscriptionsto commercial services are needed. Please see the InstallationInstructions for help with setting up this app. I recommendsubscribing to email updates to the OpenSeizureDetector web site orFacebook Page if you use the app so I can contact users if I findan issue you should know about. Note that this app is experimentalso may not be reliable at the moment, but comments would beappreciated. That said, I have had some positive feedback fromusers saying that it has detected tonic-clonic seizures reliably,but it has not been subjected to 'proper' qualification testing.For more details of how this works see the OpenSeizureDetector website. Note that this is free software with source code releasedunder the Open Source Gnu Public Licence, so is covered by thefollowing disclaimer which is part of the licence: I provide theprogram "as is" without warranty of any kind, either expressed orimplied, including, but not limited to, the implied warranties ofmerchantability and fitness for purpose. the entire risk as to thequality and performance of the programme is with you. (apologiesfor the legalese, but a couple of people have mentioned that Ishould be careful and include a disclaimer explicitly rather thanjust use the one in the licence). This simple app is intended to help you findsomeone that may not be able to tell you where they are (if forexample they have had a seizure which has been detected by theOpenSeizureDetector main app, or if they can become confused.The OpenSeizureDetector Locator app needs to be installed on theirphone, and they use the settings to set a secret password. If theirphone receives an SMS text message containing that secret password,it will reply to the message with a special GeoSMS text messagethat contains their location.The OpenSeizureDetector Locator app can detect a GeoSMS messagebeing received and display the location on a map (I recommendinstalling OsmAndto provide the map function, as this works without an internetconnection).So to work best, OpenSeizureDetector Locator should be locatedon both phones - that of the person who needs to be found, and thatof the person looking. Seehttp://www.openseizuredetector.org.uk/?page_id=600">OpenSeizureDetector.org.ukpage for more details.There are obvious privacy issues associated with this app, soplease set the password to something suitably obscure so no-one canguess it. View your mail inbox, search mails, view attachments, reply tomails, forward mails and compose mails with keyboard, predictionsand emojis ... or use third party keyboards, like TouchOne ... allon your Wear OS (was Android Wear) smartwatch. This Android Wear OSmail client brings email on your watch to a new level. Enjoy thisdedicated mail for Android Wear client. Supports standalone accessto your email on Android Wear 2 watches paired with iOS or Androidphones. For standalone support install the app from the play storeon the watch only. Easy setup: - Quick sign-in with your Googleaccount - Quick sign-in with email & password for Outlook,Yahoo, etc - Add IMAP account from other mail providers - Multipleaccounts can be added Mail inbox: - View your inbox on the watch -Read whole mail threads, message by message - Mark mail as readwhen you open it - View attachments in mails - Attached images canbe auto-loaded - Mail content is displayed in a structured way withclickable hyperlinks using the Wear Internet Browser(https://play.google.com/store/apps/details?id=com.appfour.wearbrowser)Mail actions: - Quick actions for reply, reply all and forward mail- Quick actions for archive, star and delete mail - Actions areavailable for mail cards and inbox mails Search mail: - Searchmails with keyboard or voice search Write mail (full version only):- Reply and reply all - Forward mail - Compose new mails - Searchcontacts with keyboard or voice search - Write mails with keyboardor voice input - Keyboard with text predictions and emojis -Pre-defined texts - Keyboard app integration, e.g.https://play.google.com/store/apps/details?id=com.appfour.wearkeyboardCards for new mails: - Structured mail content - Mark mail as readif card is swiped out Customize vibration patterns and sound (fullversion only): - Choose "Notification Settings" on new messagecards or long press on a message - Define a specific vibrationpattern for the sender of an email, the mail prefix or for allmessages of the account - Define a specific notification sound forthe sender of an email, the mail prefix or for all messages of theaccount - Choose a pre-defined pattern or record your own patternCustomize your mail experience (full version only): - Configurereal name and signature - Configure pre-defined texts - Configureauto-load images - Configure mark-as-read - Configure categoriesfor cards: Primary, Social, Forums, Updates, Promotions - Configurecard style: content length and stack cards - Custom vibrationpatterns The Wear Mail Client is compatible with all Wear OS(Android Wear) smart watches. e.g. - Sony SmartWatch 3 - MotorolaMoto 360 - Fossil Q (Explorist, Marshal, Founder, Venture, Wander,...) - Ticwatch (E, S) - Michael Kors (Bradshaw, Sophie, ...) -Huawei Watch (2, Leo-BX9, Leo-DLXX, ...) - LG Watch (Urbane, Sport,R, Style, …) - ASUS ZenWatch (1, 2, 3) - Samsung Gear Live - TAGHeuer ...and many more If your watch is not listed, please check ifyour Smartwatch runs Wear OS (former Android Wear). The most complete calendar app for your Wwar OS (was Android Wear)smartwatch: 3 calendar layouts with different level of detail, 7, 4and 1 day per row. Daily agenda overview and event details view.Customizable calendar layouts and colors in the full version. Add,edit and delete events directly from your smartwatch in the fullversion. A must have productivity app for your smartwatch.Features: - Say "Open calendar" to start the app on your AndroidWear smartwatch - Swipe left to view 3 different calendar layoutswith different level of detail - Events will be automaticallypicked up from your phones calendar accounts without further setup- Support for multiple calendar accounts - Voice control - OpenMaps with event location - "Today" button shows today's agenda -Fast time picker user interface - Configurable calendar layout andcolors (full version) - Add events directly from your smartwatch(full version): Specify description, start- and end date and time -Edit existing event time and description (full version) - Deleteevents (full version) - Complete productivity app The full version(in-app purchase) offers: - Add, edit and delete events - 3configurable calendar layouts: days per row (1,2,3,4,7) and eventsper day (2-9) - Configurable colors for events, holidays, birthdaysand more - Configurable pre-defined event texts Supportedsmartwatches include all Wear OS (Android Wear) smartwatches: -Sony SmartWatch 3 - Motorola Moto 360 - Fossil Q (Explorist,Marshal, Founder, Venture, Wander, ...) - Ticwatch (E, S) - MichaelKors (Bradshaw, Sophie, ...) - Huawei Watch (2, Leo-BX9, Leo-DLXX,...) - LG Watch (Urbane, Sport, R, Style, …) - ASUS ZenWatch (1, 2,3) - Samsung Gear Live - TAG Heuer ...and many more If your watchis not listed, please check if your Smartwatch runs Wear OS (formerAndroid Wear). Protect your phone and Android Wear Smartwatch battery fromovercharging with THEFT alarm. This app notifies you when yourbattery is fully charged. You can also select battery level andmany customization. ------------ NOTICE: If you use any task killerapp, please add this app to ignore list or white list. Otherwise,application will not work properly. NOTICE FOR ONEPLUS ABOVE 7.0USERS: Please go to battery optimizations settings on androidsettings and uncheck battery optimization for this app to use autostart features. NOTICE FOR XIAOMI USERS: In the security settingsgiven by Xiaomi default, please include the app for auto start andalso include permissions to use auto start features. ------------This application supports Android Wear Smartwatches!! Anti theftalarm!!! Don't worry about having to leave your phone chargingunattended! Full Battery & Theft Alarm will sound an alarm whenyour phone is unplugged or battery fully charge. Useful for when aplug isn't near somewhere to sit so that you can leave your phoneand know it will be safe. Charger alarm!!! Alerts you with audioand vibration when your phone is fully charged. Great for when youwant a quick charge without checking your phone every minute. Alsogreat if you don't like leaving your phone plugged in after it'scharged. Features: - BATTERY PERCENTAGE - Charge history - Chargetime. - Remaining time to 100% - Sound and vibration alarm whencharger is unplugged. (Anti theft alarm) - Password security fortheft alarm. - Easy to use user interface - Status message aboutapplication - Choose custom alarm. You can also choose silent. -Alarm volume control. - Vibration option. - Full battery alarm. -Start automatically option. - Enable automatically option. -Notification bar option. - Different thief alarm sound option. -When alert full battery alarm, you can unplug your cable to stopalarm. - "Do not stop alarm until unplug cable" option. - Turn offtheft alarm if all you need is battery full alarm. - Extra timefeature after fully charged. - Start auto after reboot. - Themeoption. - FREE Please Email Suggestions and Bugs!.----PERMISSIONS---- Storage permission: App need this permissionfor external ringtones, log system and backup/restore settingssystem. Location permission: App use this permission only for adlocalization. Contact permission: App’s theft alarm passwordrecovery system. App’s fills your email address automatically whenyou are setting theft alarm password. Nothing more. You cancompletely trust this app. We are not doing any illegal process.------- To become beta user please use this link:https://play.google.com/apps/testing/com.pextor.batterychargeralarmThank you..